A different way to enjoy pork. Imagine a perfectly roasted rib-end roast complemented by a delicate sauce composed by the creaminess of milk, the sweetness of roasted garlic and onions, the acidity of white wine and the richness of the cooking drippings of the roast. 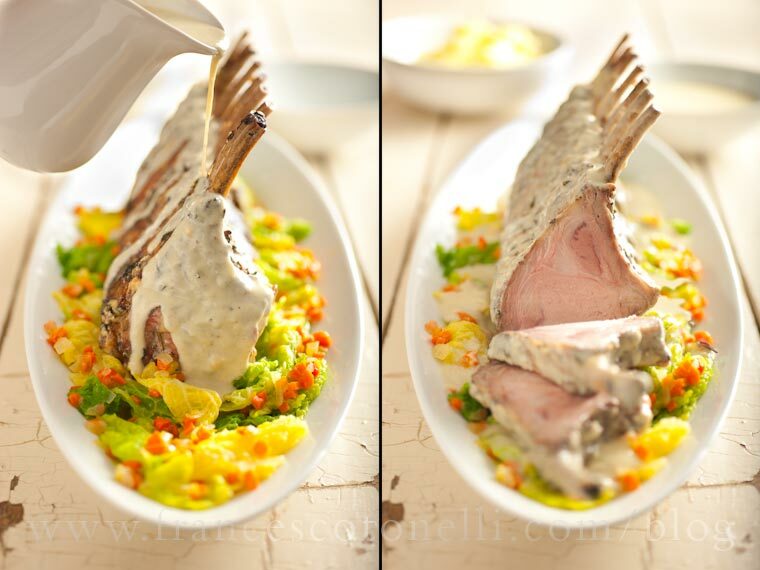 This recipe is inspired by a typical preparation from the Italian region of Lombardia called "Arrosto al Latte" and I see it as a humble, more simple version of the Classical French Veal Orloff with the sauce being a rustic version of the Soubise. Of course it could be prepared with veal instead of pork if you prefer. Mild, elegant, yet rich, it is wonderful accompanied by braised Savoy cabbage and potato purée. Absolutely incredible if you could shave some white truffle on it just before serving. But that's totally optional. I like to use the rib-end not just because it makes a beautiful presentation, but mostly because of the texture and flavor that this particular cut offers thanks to the tenderness and fat content of its meat. It is the pork counterpart of a beef standing rib roast or prime rib. To prepare it, season the loin with salt and pepper at least 1 hour before you plan to cook it. In the meantime dice a large onions and peel six cloves of garlic that will cook with it and also start preparing the side dishes you are planning to serve. When the seasoning has penetrated the meat, rub it with a little olive oil and sear it all around on high heat inside a large sauté pan or roasting pan until a nice golden color is achieved on all sides. At this point place the roast in a roasting pan with some olive oil and butter, the onion, the garlic cloves and one or two sage leaves. 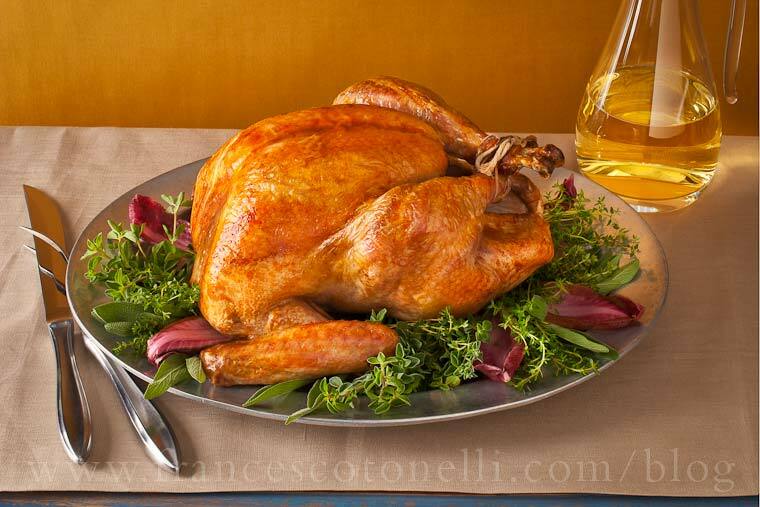 Degrease and deglaze the pan with a glass of white wine and pour the resulting liquid in the roasting pan. Slowly roast it in a 300F oven for about 1.5 hours or until the internal temperature reaches 155F basting the meat every 20 minutes and adding small amounts of white wine and broth to the fond to prevent onions and garlic to over-color in the fat. Once the roast is cooked, remove it from the oven and from the roasting pan and hold it covered with aluminum foil on a platter in a warm place. The internal temperature will carry over a bit and then the meat will rest and it's juices will re-distribute. Use this time to remove the sage leaves from the roasting pan and add about 2oz of AP flour to the fond. Cook the flour with the fat drippings over medium heat for a few minutes stirring with a wooden spoon to form a roux. Remove the pan from the heat and add 1 qt of cold whole milk in small batches, stirring to avoid lumps. Bring the sauce to a simmer and cook for about 15 minutes until it has reached a rich sweet flavor and consistency. Add any juices that came out from the roast while resting. Adjust consistency by reducing further if too liquid or by adding a touch of milk or water if too thick. Taste and adjust flavor then pass through a fine strainer or blend in a blender until very smooth. Fine tune the flavor with more salt and pepper and if you like add a few drops of lemon juice for a touch of acidity. When ready to serve, pour some sauce over the roast and serve the rest of it on the side along with the braised cabbage and potato pure'.